3/9/17: The Vermont National Guard hosted 120 athletes from 23 different states last week for the 2017 Chief, National Guard Bureau Biathlon Championship at Camp Ethan Allen Training Site in Jericho. Soldiers and airmen competed in this biathlon which entails cross country skiing and precision target shooting. The four-person team of athletes from Vermont included a former Olympian and placed second overall. Six Vermont National Guardsmen competed in the races and two earned spots on the All Guard Team, first lieutenant Danielle Bean and staff sergeant Jesse Downs. 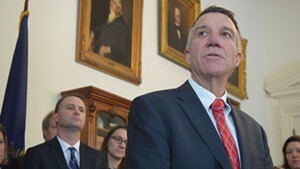 Music: Silent Partner, "River Flow" Ethan Meixsell, "Sea of Sand" Gioachino Rossini "William Tell Overture"
Martial Lawmakers: Should the Legislature Elect the Leader of the Vermont National Guard?